The LTC4301L hot swappable, 2-wire bus Buffer allows I/O card insertion into a live Backplane without corruption of the data and Clock busses. In addition, the LTC4301L SDAIN and SCLIN pins are compatible with systems with pull-up voltages as low as 1V. Control circuitry prevents the Backplane from being connected to the card until a stop bit or a bus idle is present. When the connection is made, the LTC4301L provides bidirectional buffering, keeping the Backplane and card capacitances isolated. When driven low, the CS input pin allows the part to connect after a stop bit or bus idle occurs. Driving CS high breaks the connection between SCLIN and SCLOUT and between SDAIN and SDAOUT. A Logic high on READY indicates that the Backplane and card sides are connected together. The LTC4301L is offered in 8-pin DFN (3mm x 3mm) and MSOP packages. This is one package pinout of LTC4301L,If you need more pinouts please download LTC4301L's pdf datasheet. 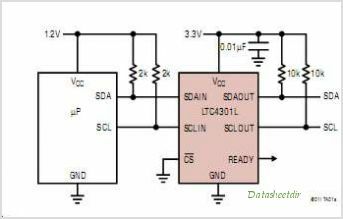 This is one application circuit of LTC4301L,If you need more circuits,please download LTC4301L's pdf datasheet.